Driver Crashes Car Into Security Barriers At U.K. Parliament; 3 Injured A man was arrested on "suspicion of terrorist offenses," police say, after his vehicle crossed through a pedestrian area Tuesday morning. Police stand in the street after a car crashed outside the Houses of Parliament in Westminster, London, on Tuesday. Police officers arrested the driver on "suspicion of terrorist offenses," the Metropolitan Police says. The agency describes the suspect as a 29-year-old man who is a U.K. national. He was at the wheel of a silver Ford Fiesta when it crashed through a stream of cyclists and pedestrians and hit a metal barrier that stopped the Fiesta and left its hood crumpled. "He is not currently co-operating," Assistant Commissioner Neil Basu said of attempts to determine a possible motive. Images from outside the Palace of Westminster that were posted to social media showed the driver in handcuffs. Near the scene of the crash, cyclists stood or sat near their bikes as medical personnel worked in the background. The London Ambulance Service says two people were treated at the scene and taken to the hospital and that a third person with minor injuries "was assessed at the scene." Roughly 12 hours after the incident, the police said the two patients, a man and a woman, had been discharged from the hospital. The car that was used in the apparent attack is privately owned and had been in Birmingham Monday night, the Metropolitan Police said in an update on their investigation Tuesday afternoon. The police said detectives were carrying out searches at three addresses — two locations in Birmingham and one in Nottingham. Our latest statement in response to the incident in #Westminster. Two patients were treated at the scene and taken to hospital and a third patient with minor injuries was assessed at the scene. The crash occurred just before 7:40 a.m. local time. In a rooftop video released by the BBC, the car can be seen suddenly veering across a small pedestrian plaza before racing down a side street and sidewalk — where police officers leaped out of the way before the car slammed into a security barrier. Armed officers arrested the driver, who was alone and unarmed in the car. The crash drew a large response from police and ambulances. 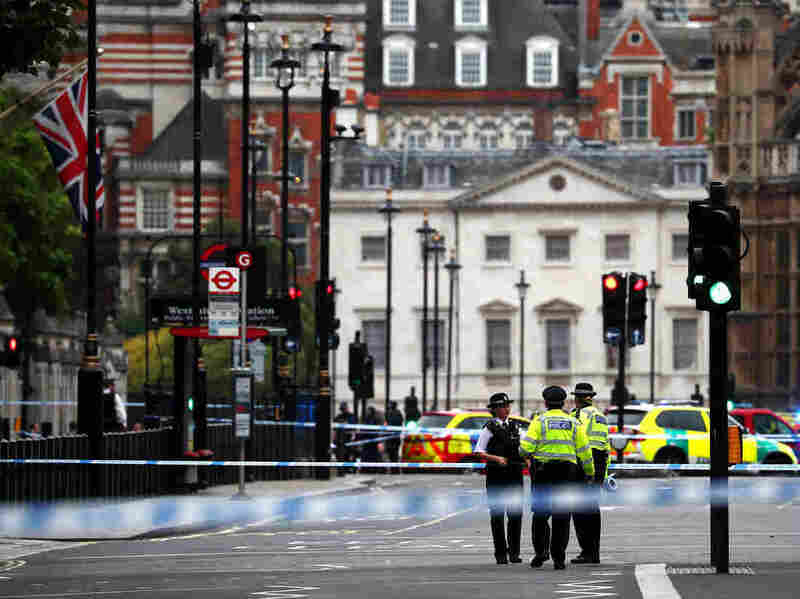 NPR's Frank Langfitt, reporting from London, says two of the injured are cyclists who were struck by the car. Jason Williams, a witness quoted by Reuters, said the car hit a barrier hard on a lane used for access to the Parliament building. Williams said it appeared deliberate. "It's a very serious incident," he told reporters, according to the news agency. "There was smoke coming from the vehicle." The police said there's no cause to believe people in London are under a continuing threat — but the department has also deployed "Project Servator officers" in Westminster. Those officers, the Metropolitan Police says, "have specialist skills to recognize when a person is displaying minute signs of anxiety... to identify anyone who may be in the area for terrorist or other criminal purposes." The U.K. Parliament, which is in recess until September, released a statement saying, "Our thoughts are with all those impacted by this incident." London has experienced three vehicle terrorism attacks since last year. In March 2017, a radical Islamist drove across Westminster Bridge, hitting pedestrians before crashing outside Parliament.